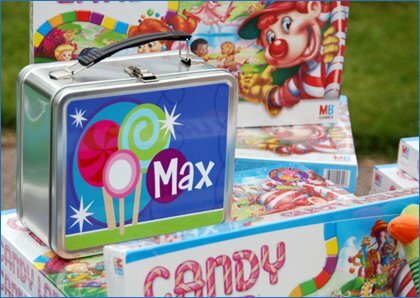 Hi Everyone – I’m back from Colorado and happy to report that Max’s Candyland Birthday Party went well! We definitely ran into some hiccups with the weather (hello, sporadic thunderstorms!) and ended up having to move everything indoors at the last minute, but it all worked out in the end… more on all that later! It will probably take me a couple days to get everything up in the Party Themes section with detailed “how-to” instructions and all that fun stuff, but in the meantime – to get something up quick – I added 2 photo albums of the pictures that Sonny took with our camera onto the HWTM Facebook Page: Candyland Birthday Party – Part l (featuring party decor, candy & favor shots) and Candyland Birthday Party – Part ll (Max, Trista & Ryan with the birthday cake). Pictured above: Max having fun with his giant birthday cupcake. Pictured below: a few quick decor shots… check out the Candyland Part l photo album for lots more images. Additional images from the professional photographer should be available soon as well…including more extensive shots of the 10-ft candy buffet! This theme looks so much fun, colorful and sweet, food sweet also! One of my favorite games and a great them for a party! I am keeping this one in the file, thanks for sharing! Even cuter than I had imagined! Can’t wait to see more. That party was for Trista and Ryan?! How fun! It looks like a total blast. I’m thinking of doing a (scaled down) version for my son’s birthday next month. Wow, looks like a great partY!!! LOVE how you used the paper lanters as candy. Such a cute idea! What a fun party! You did such a great job. I can\’t wait to see more. The lunchboxes for the little ones are adorable. This is fantastic! I love all the colors! I love how the theme is in every detail…you did an amazing job! Max looks so adorable with his face full of chocolate! I bet all the little ones at the party had a crazy sugar high with the candy buffet! If I were a kid again, this is definitely the party I would want to be invited to! Okay, it’s not Newsweek, but come on – that is awesome! Fun! What a beautiful party for such a beautiful family! Can’t wait to see more pics…and suddenly I’m craving skittles and licorice! i love the decorations along the fence! Such an amazing party Jenn! It looks like so much fun! They’re super cute, but also a little pricey if you want to do a ton of them…in addition to party favors though, they’d also be super cute as centerpieces, in which you’d probably need less! Oh my gosh, So CUTE! That’s a party everyone of any age would love to go to. Who can resist a candy buffet?! I love this party it’s so sweet! and would you please tell me were you got the lanterns from? I just found out the shirt Trista is wearing can be found at http://www.shopdreem.com…I LOVE it…she looks great!! 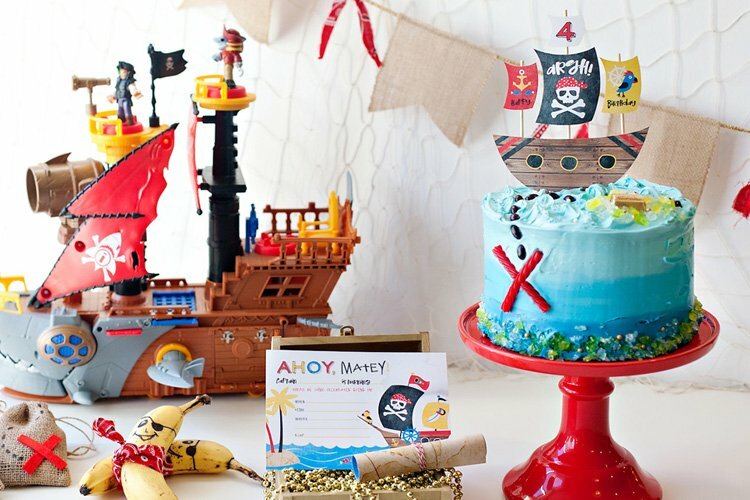 Great theme party…where did you get the cute paint tins for the favors? It looks like Sweet Factory on the label. They are little Sweet Factory pails – and SF actually just sent them with the candy, so I’m not sure if they sell them individually. I didn’t see them online, but I’m going to ask the person I worked with over there next week. I hope they do sell them because they were the perfect size and super cute. If not, you could always use mini takeout cartons in either translucent or solid colors. I’m helping with my niece’s b’day party who will be turning 4 next month. I was surfing the internet for all candyland ideas and your info came up, so I can not wait to share this with my sister. I’m so glad to see you and your family are doing well. I’m planning my daughters 1st b-day party, which happens to be a candy theme. I sent out lollipop invites, and I was wondering if you have any other creative decoration ideas or games in mind. 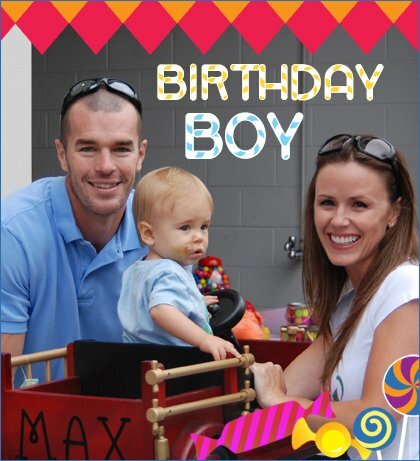 I loved your sons party setup it was amazing……. Can you tell me where you got the centerpieces? Wow. Beautiful. Just wondering where you purchased those lollipop inspired fans from (the decorations with the stick and placed in the grass). I am driving myself crazy trying to find similar invitations used for Max!! The candy tree was ADORABLE!! The colors are perfect for my daughter’s first birthday! If anyone can help me find the designer I would be so grateful!!! Summer – the “fans” are from lunabazaar.com. Here’s the direct link (they’re actually called “paper daisies”). The pillows are from sweetfactory.com and the tree decorations are actually round paper lanterns from lunabazaar.com (6″ – 12″ sizes) wrapped in cellophane and tied off at the ends with ribbon. The cellophane rolls are available at craft stores like Michaels and Hobby Lobby. if you are looking for CandyLand invitations that are ADORABLE check out paperheartpress on etsy.com – i am so happy with the quality and turnaround time…not too mention how cute they are! Jenn….I must say that u have come up with some great ideas.Well I wont take up too much of your time….I just wanted to know where did u get the whirly pops yardsticks or if u made them….how did u make them I would luv to know.May god continue to bless you and your family. I actually lucked out and the candycane base for the largest “whirly pops” those at a decor store near me called “Shinoda Design Center” – but they were in the Christmas section, so online holiday stores might be a good place to look for them! And then the lollipop tops are actually “paper daisies” from lunabazaar.com. The giant REAL whirly pops that are stuck in the grass are from Sweet Factory. 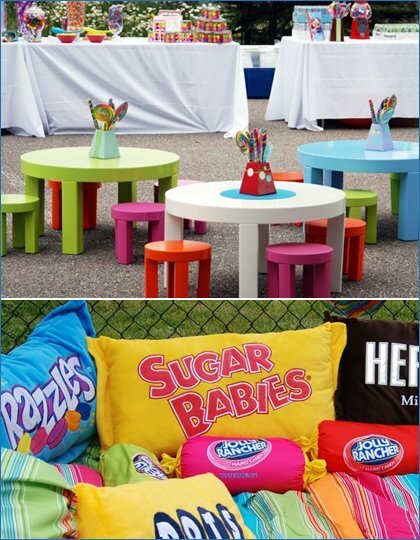 Jenn…I love the ideas you came up with for this party…I am planning a candy land party for my daughters first bday….where can I find the personalized banner ?? 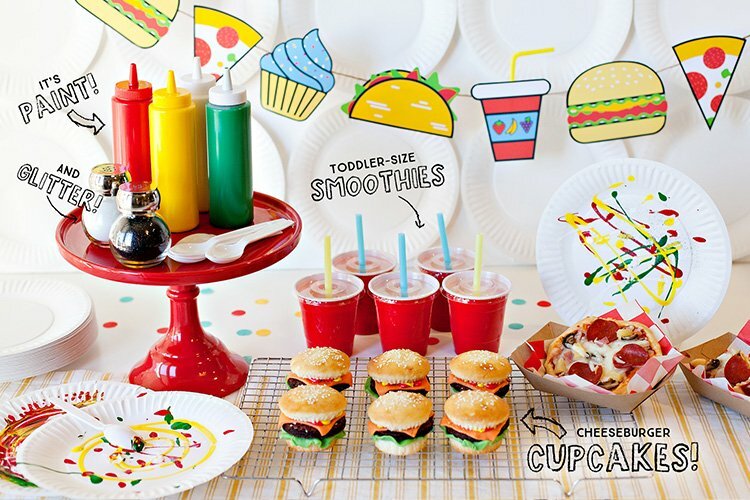 I want to use the same plates and napkins for my daughters party as well…..I love all the bright colors however im having a hard time finding them, any suggestions ?????? 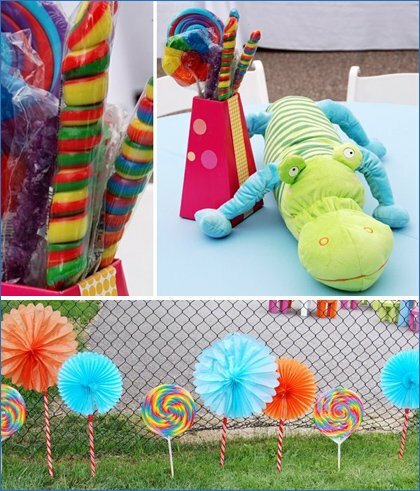 I am truly impressed and inspired by this, I was planning a candy land theme for my daughter. I have taken so many notes from you. I would like to know where did u get the lunch boxes from and how did you decorate them. 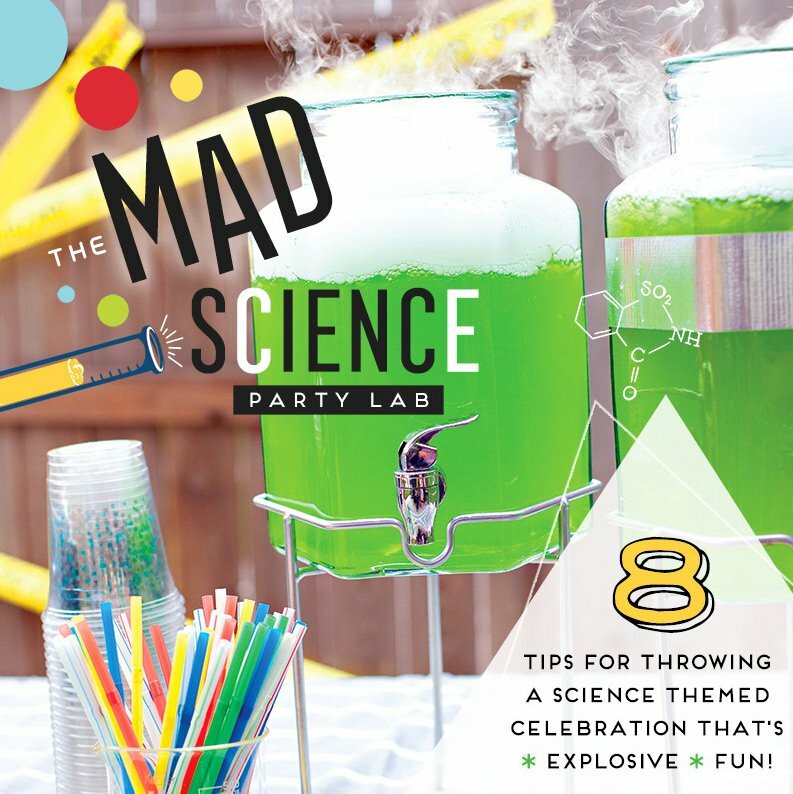 This is the cutest party idea ever…where can I find the customized banner ?? Also I am having a hard time finding the plates and napkins used there, any suggestions ?? yes i need some help for my little niece birthday party the theme id candyland. and we are still not sure how to do the cake so i was wondering if u cansend some pictures to see how are we going to make it. Just wondering what you did for invites?? I am doing a Candyland Birthday party for my daughter and needed some ideas for invites?? I actually designed the invites myself, but Trista just emailed them out. Here’s a link to what they looked like (we ended up going with the first version). I plan to offer these invites soon on a website called PolkaDotDesign.com, but they won’t be up for at least a few weeks, so it may be too late for your party. For those of you on a tighter budget, I used Just Artifacts (www.justartifacts.net) to order some paper lanterns. Great prices and quick delivery! The lanterns look just great. Currently they are having a sale on their lanterns. where can I get teh lunchboxes? I am doing a candyland 1st birthday too! 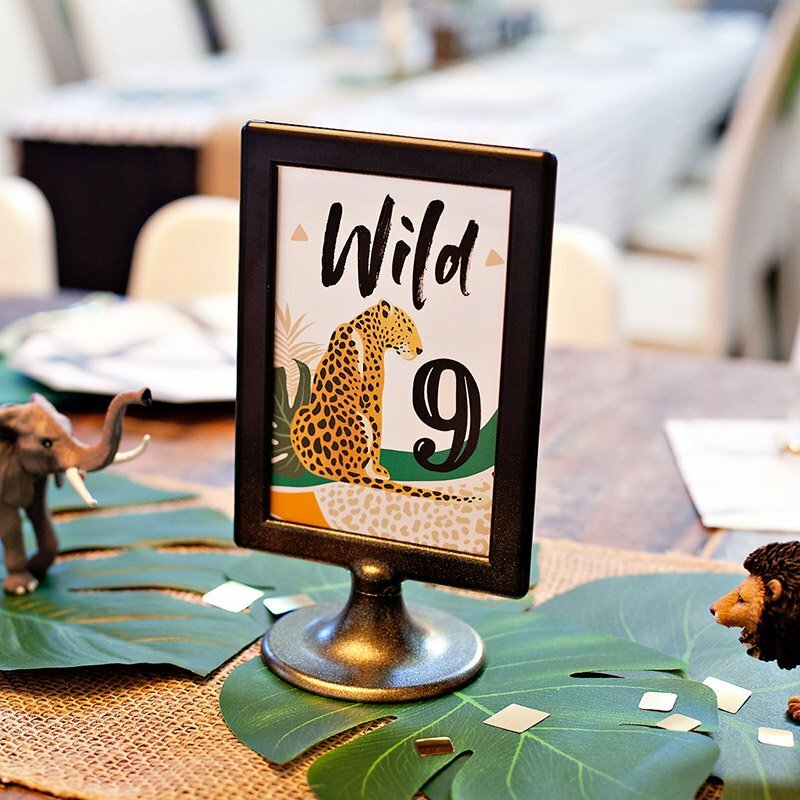 They’re super cute, but also really pricey if you want to do a ton of them…as an alternative to party favors though, they’d also be super cute as centerpieces, in which you’d probably only need a few! 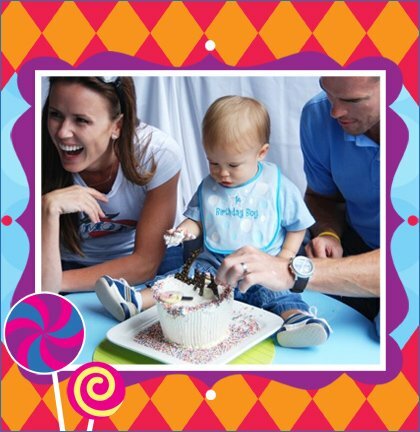 Hi I was looking through your website and found the Candyland First Birthday Party. I love them but would like to know if you have one for a chocolate party thank you so much. OMG! I was just putting my daughter’s party together for her first bday and we’re doing a Candyland theme because her nickname is Lolipop. I was looking for ideas and came across this. This is so cute!!!!! Your family is beautiful Trista! Thanks! Where can I get the customized banner!!??? Jessica, I did Candyland and could not find the corresponding banner for it, so I found a personalizable banner kit at my local Party City for the same price. Very coloful. It came with 4 signs and many extra letters and numbers, so it went very well with the party. Good luck. 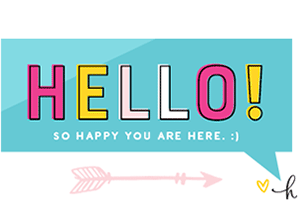 If you’d like to order the same Candyland banner from this party for your own event, you can order it through Emagine Digital: http://emaginedigital.com/. The banners are 6 feet wide by 28″ tall, printed on vinyl with grommets for hanging, and can be customized with your child’s name an age. Price is $75. To order, send an email to [email protected] with name/age info for the banner, shipping address, and date the banner is needed by. The different colored kids tables are wonderful! Were those purchased or rented? Thanks so much. Well looks like a sweet birthday ! I want to find the pillows?